I took your advice and put together some instructions. I still need to finish the last page which explains how to sew the sweater piece to make the cozy. I am looking for feedback. You can click on the photo to make it bigger if you are having a hard time reading the instructions. Are the instructions clear? Do I need to add more detail? That looks great! 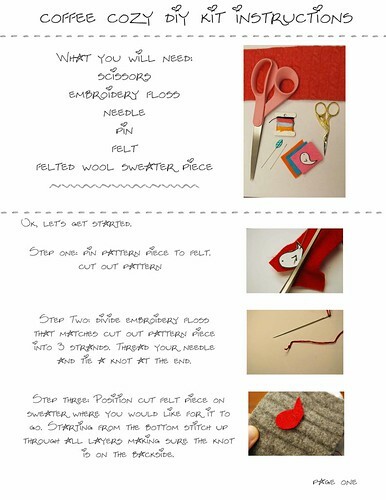 The directions are clear and you gave people a link on learning basic stitches if they're new to this. Love it! Yep. Very clear and perfect even for instructionally-challenged gals like me. I'm trying to make a few of these myself, and find I am having the worst problem with the wool sweaters! One is a blend of lambs wool and silk and is pilling with huge clumps, and the other is an Old Navy 100% wool sweater that is not felting at all. So maybe some pointers on the wool sweaters you use would be helpful. :-) I enjoy your work! Cute pattern and great blog! I've been contemplating doing a pattern for some of my dolls. What kind of software do you use for your pattern? 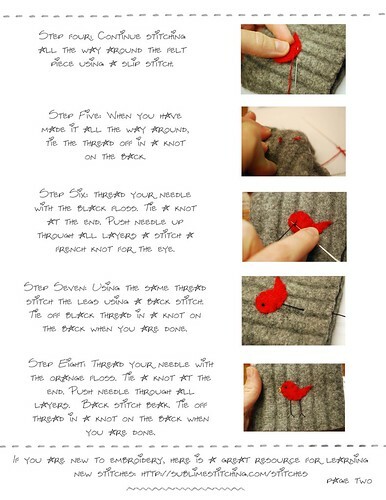 What size of a felted wool piece are you using? Lisa- I try to only use 100% wool sweaters. I wash them on hot and usually run them through a couple of cycles. Then I dry them on high. The only time I have had issues is if the weave on the sweater is bigger then sometimes it does not felt up as tight. Anonymous- I don't have a pattern that I use I cut different sizes depending on the size of the cup and how much the sweater stretches. Mine are usually around 3 x 8 inches if I had to guess.